The High Tide Golf Tournament is new to our events calendar this year and as Rockliffe Hall’s charity partner, we hope to raise as much as possible to support our industry-led programmes. 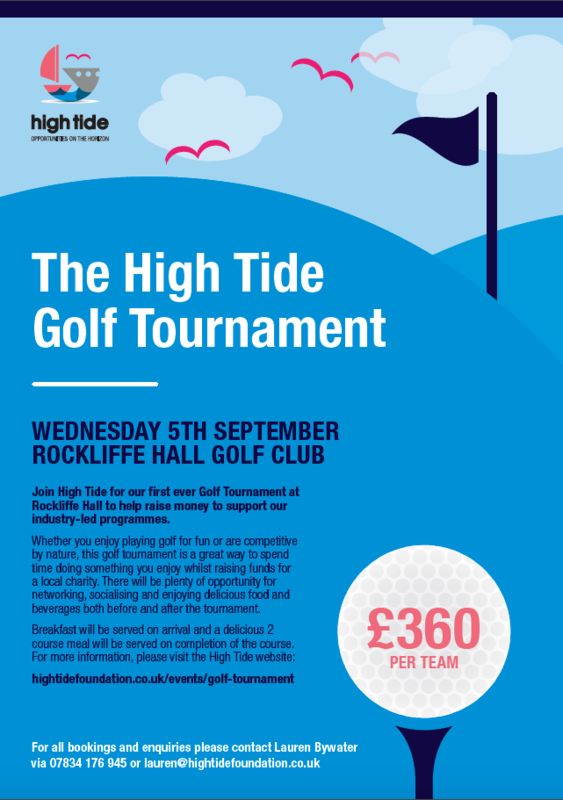 If you’d like to take part in a four-ball tournament on Rockliffe Hall’s five star golfing facilities then why not join High Tide this September. Whether you enjoy playing golf for fun or are competitive by nature, this golf tournament is a great way to spend time doing something you enjoy whilst raising funds for a local charity. There will be plenty of opportunity for networking, socialising and enjoying delicious food and beverages both before and after the tournament. On arrival you will be served breakfast rolls as well as tea and coffee to get you started. After completing the course you can sit back and relax with your fellow golfers and a delicious 2 course meal will be served whilst you take in the stunning grounds of Rockliffe Hall Golf Club. The cost per team is only £360, for all bookings and enquiries please contact Lauren Bywater via 07834 176 945, lauren@hightidefoundation.co.uk.